You must be a registered member of the Graham Ave. BID in order to vote. Voting is conducted by class-Commercial Business, Property Owners, Resident. In order to vote, please email grahambid@verizon.net by Oct. 19, 2018 to register. If you have signed into a BID meeting in the past year, you are already registered. Let us know you’re joining us and if you are bringing a guest. For non voting members in the BID or friends of the BID…just email- grahambid@verizon.net or call 718 387 6643 by Oct. 19th to let us know you are joining us for this free evening of local business, food, beverages and fun. The new season of the Graham Avenue Farmers Market will begin on Saturday, July 8th from 8 am to 5 pm on Cook Street near the corner of Graham Ave. (near the parking lot of PS 257) in Williamsburg- It is one of Brooklyn’s oldest and longest running independent markets in the borough! 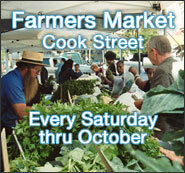 The market runs every Saturday until Oct. 28th. Fresh fruits, veggies, Amish pastries and breads, honey and then some will be featured by our farmers. Many items are organically grown and fresh from the farm for you to enjoy! Besides cash sales, the market accepts SNAP, WIC and other government sponsored programs. For every $5 spent through SNAP customers receive a $2 Health Buck to spend at the market. Music, face painting, children’s activities and other fun events are being planned for this year’s market season. Come out and enjoy our local market with your friends and family and learn about health eating through our Free Food demo’s…where you can also earn Health Bucks by participating! The market is sponsored by the Graham Ave. Business Improvement District. For further information call 718 387 6643 or email grahambid@verizon.net from Monday to Friday.